Encyclopedia Britannica traces the development of modern tools and dies to American inventor and manufacturer Eli Whitney, the first to implement the concept of planned manufacturing of interchangeable parts. Whitney preached the production of components to prescribed dimensions with the aid of tooling. This meant that the highly skilled craftsmen previously required for manufacturing no longer were needed, since the concept eliminated the need for additional fitting or selective assembly of parts. Whitney’s tooling consisted of templates (tool-guiding patterns) and rudimentary fixtures, the precursors to today’s tools and die. Whitney and his company successfully demonstrated the feasibility of manufacturing interchangeable parts by mass-producing firearms for the War of 1812. The successful introduction of interchangeable parts and the development of machine tools, both occurring in the 19th century, brought about the modern machine shop. Then, as today, the independent machine shop was called a job shop. These shops served larger industrial facilities by fabricating tooling, machines and machine part replacements, rather than manufacturing their own products. Eventually, some machine shops began to specialize in tooling to the exclusion of other work. The development of the power press gave rise to a demand for another form of tooling, the pressing die. This type of tooling cuts and presses sheetmetal into predetermined shapes and configurations. Since the tasks required to fabricate dies closely mimic those needed to produce jigs, fixtures and other tooling, many of the specialized machine shops began to call themselves tool and die shops. Soon after World War II, the industry welcomed numerical-control (NC) machines. NC machines used a series of holes punched on paper tape or punch cards to control their motion. In the 1960s, computers began to add flexibility to the process, thus introducing computerized numerical control (CNC). NC and CNC machines could precisely repeat sequences over and over, and also produce more complex shapes than even the most skilled toolmakers. The last half of the 20th century welcomed the transformation of traditional tool and die shops into specialized job shops that produced only one form of tooling. This trend can be attributed to the growing sophistication of tooling, plus the fact that shops with the skills and equipment necessary to fabricate one form of tooling were seldom equipped for another. Even the single form of toolmaking called diemaking became further specialized to the point that many shops now limit themselves to dies for special applications or industries. The North American tool and die industry primarily comprises small businesses using skilled, experienced employees. According to the U.S. Bureau of Labor Statistics, 90 percent of tool and die companies employ fewer than 50 workers. These firms are generally privately owned and often family operated. 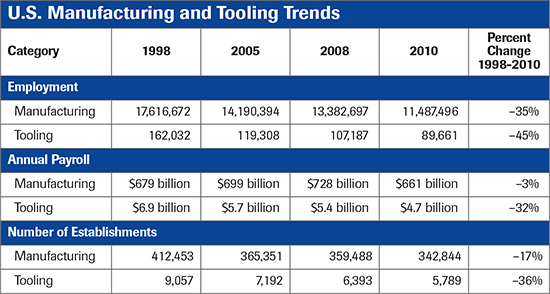 The number of U.S. tool and die shops dropped by 36 percent between 1998 and 2010, more than twice the rate of decline as in the total number of manufacturing establishments. Similarly, employment in tool and die has dropped steeply. Although tool and die firms are small in number and total employment, they play an essential role in manufacturing innovation. Any durable-goods manufacturer seeking to introduce a new product likely requires customized tools, dies and molds to make metal, plastic and ceramic components. While most tool and die production supports the manufacture of durable goods for the consumer market, the industry also plays an important role in manufacturing military equipment. The tool and die industry always has been subject to U.S. economic swings and foreign competition. The rise of China’s manufacturing sector has placed it under considerable stress. Foreign competition, application of new technologies and two recessions caused a loss of more than one-third of all tool and die establishments since 1998, and nearly a 50-percent workforce reduction. We see signs that the tide may be turning: U.S. durable-goods manufacturing appears to be reviving, and reshoring of jobs from overseas promises to benefit U.S tool and die shops. However, ongoing technological advances will require tool and die shops to operate differently than in the past, and also require a workforce with a different set of skills. The lack of interest in careers in tool and die making has forced many shops to find other ways to produce their products, primarily by increasing the use of automated equipment. In some companies, lights-out manufacturing has become the norm. Here, a night shift runs with minimal worker involvement. Machines do much of the work that employees perform in regular shifts. I want to thank you for your provocative article. As a retired Toolmaker I concur with a bit of your thoughts and perceived analogy. Key to your comments, may I suggest that your concept of what a Toolmaker brings to the table may be short sighted. As it turns out; the true Toolmaker is a Practical Engineer, who, if he's worth his or her salt, finds themselves in effort of interpreting the engineers concepts, and turn out those thoughts and ideas into reality. The truth: Production in general requires precise, knowledges, control, and dedication, to process control. World Class manufacturing is finite detail, of everything, from the Engineers Concepts, to the entire stream of professionals, to yield to that requirement. It is a moving target, it takes highly interested motivated people to make it happen. Toolmakers are forever!